Following the family concert at 1:30 PM, Mario Grillo and The Machito Orchestra members lead a Rhythm Section Workshop in the Repertory Theater. They will discuss, demonstrate, and answer questions on what makes a Latin rhythm section work, demonstrating how congas, bongos, and timbales complement the bass and piano, which is now the standard in Latin music. In addition to Mario Grillo on timbales and percussion, the workshop includes Eddie Montalvo (congas), Luis Mangual, Jr. (bongos), Gilberto 'Pulpo' Colón (piano), and Jerry Madera, bass. The workshop is hosted by the percussionist / educator Annette A. Aguilar. All ages are welcome. Admission is free, but registration is required (See below for details). A panel discussion entitled “Machito, Bauzá, & Graciela: Creating a Genre that Endures” follows in the Repertory Theater at 3:30 PM. Loren Schoenberg, Founder and Senior Scholar of the National Jazz Museum in Harlem, moderates this discussion of the trio's lasting impact on Latin jazz and Latin music. 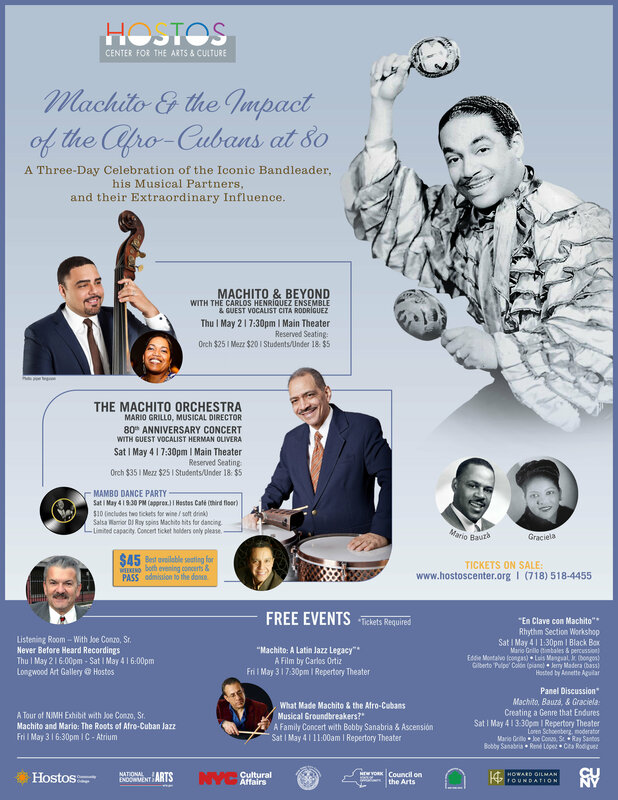 Panelists include: percussionist and Musical Director of The Machito Orchestra, Mario Grillo; archivist / biographer, Joe Conzo, Sr., saxophonist / composer / arranger Ray Santos; percussionist / bandleader Bobby Sanabria; author / historian René López and vocalist / educator Cita Rodríguez. Admission is free, but tickets are required. (See below for details). Mario Bauzá (1911 – 1993) was an Afro-Cuban jazz musician. He was one of the first to introduce Cuban music to the United States by bringing Cuban musical styles to the New York City jazz scene. While Cuban bands had popular jazz tunes in their repertoire for years, Bauzá's composition "Tangá" was the first piece to blend jazz with clave, and is considered the first true Afro-Cuban jazz or Latin jazz tune. Bauzá had been hired as lead trumpeter and musical director for Chick Webb's Orchestra by 1933, and it was during his time with Webb that Bauzá both met fellow trumpeter Dizzy Gillespie and discovered and brought into the band singer Ella Fitzgerald. Importantly, Bauzá introduced the young Havana virtuoso Chano Pozo to Dizzy, when the latter wanted to add a Cuban percussionist to his band; though Pozo was killed in a Harlem bar fight just a year later, he left an indelible and long-lasting mark on Dizzy's playing and compositions, co-writing several legendary compositions such as "Manteca" and "Tin Tin Deo". In 1938 Bauzá joined Cab Calloway's band, later convincing Calloway to hire Dizzy Gillespie as well. Bauzá continued to work with Gillespie for several years after he left Calloway's band in 1940. The fusion of Bauzá's Cuban musical heritage and Gillespie's bebop culminated in the development of cubop, one of the first forms of Latin jazz. In 1941, Bauzá became musical director of Machito and his Afro-Cubans, a band led by his brother-in-law Machito. The band produced its first recording for Decca in 1941, and in 1942 Bauzá brought in a young timbalero named Tito Puente. "Cubop City" and "Mambo Inn" followed the success of "Tanga." Machito and his Afro-Cubans often played straight-ahead big band mambo music. Many of the numbers were covers of recordings which had proved popular in Cuba. The band played mambo-style dance numbers at venues such as Manhattan's Palladium Ballroom. Bauzá kept his post as director of the Afro-Cubans until 1976. After this he worked sparingly, but was always highly respected. – Wikipedia. Previous NJJS 50th Annual Pee Wee Russell Memorial Stomp!